Actress Claudia Black stars in the all-new CW miniseries Containment. Photo Credit: Nate Taylor. GALO: So what you’re essentially saying is that Containment is trying to send a different kind of message altogether about fear in such situations. Do you think that is one of the reasons audiences will connect with the show? CB: Yeah, I think so. I think it is at a very primal level. It finds us in a place where we are very afraid, but it also identifies in us the very thing that has kept us going. Even though we have these beautiful blended families now and people raising children who are not theirs to begin with, it takes people to create something. I think at our core, we really need to collaborate and work together, and what’s devastating about this virus is that people cannot touch each other. They cannot get intimate or close. It really makes people reevaluate the importance of closeness and intimacy, and that is really beautiful to me. I am a real romantic soul. I get frustrated with a lot of romantic comedies, I admit. I may not agree with choices [that are made] — even in this show — but I think we are attempting to do something meaningful. When I first saw some of the images, I thought, ‘wow, we have taken this really far with [the] blood and gore — this is reality.’ It has opened up a different conversation for me about violence. I am raising two boys, and I talk to them in a conscious and constant dialog about [their question of]: “Can I have a toy gun?” In my day, it would have been fine and wouldn’t have had the same implications, but now there is [this] responsibility as a parent in America to tell my kids, “we can’t play with guns as if they are toys right now because you are going to be so desensitized, and at some point, you may pick up a real gun because they are so readily accessible and you won’t know how to use it!” I think someday my children will probably have to learn how to handle a gun, even though I don’t want them to own one, just so they can appreciate that they are actual weapons. I think this show is not…we are not being gratuitous about the way we depict violence in our culture, and what is more terrifying about this one is that it is about something microscopic that is tearing us apart. It’s a beautiful irony to explore. GALO: I know it has been said that this is a miniseries, but do you see a potential for future seasons of the show? CB: I think we are hoping for longevity. I think there is more of the story to tell, and I think that you can only do that if you have planted something special in terms of the relationships and individuals involved. It is an interesting show to work on because it really is an ensemble cast. GALO: Definitely. I was also curious about your work with Julie Plec because like your co-star Chris Wood (The Vampire Diaries), who plays Jake Riley, you have worked with her before. What was it like working for her on this show as opposed to the The Originals? Obviously, they are poles apart, so I am interested to learn how much different the vibe was on both shows. CB: Having been in this business for 20 years, I believe the culture is created from the top down. I think actors in general understand (especially those from the theater background) and appreciate the importance of a community-based collaboration, and so those who are in stage work are your sparring partners and we are required to create an environment in which we can play. There is a misconception that acting is about pretending. I believe actors play on their vulnerability and are risking it all, and then it becomes universal and accessible to the people. Julie just has this massive heart and is an incredible human being who is a voracious storyteller. She is a machine — the way she handles the projects she is helming. On the set of The Originals, people were so thoughtful, mindful, creative and collaborative in every department. Playing the two different characters was interesting because it is easy to play a villain. I joke to my sons and say [that] if you want to spot a villain in the ’80s or ’90s movies, they’re normally speaking British and the men have a lot of eyeliner. Nowadays we are getting more subtle. Sabine Lommers on Containment is a tough woman to play because she is so three-dimensional. There is a part of her which wasn’t easy to explore because we all have those shadows in ourselves and in our culture, and yet when you are playing a fantasy character, there is always this element of drama and obvious playfulness. When you work on something like The Originals, [you ask yourself]: who wouldn’t want to pretend to be a vampire or a witch? But when you play someone like Sabine, I felt her loneliness. It’s close to the bone in terms of humanity and who we are and what that says about us as people. Her coldness and necessity for it informs every aspect in her life. I can’t imagine what it’s like to live that way. Sometimes you walk away with that icky [feeling] on the set and I was like, “someone please hug me,” you know? Julie, having already worked with a lot of young cast members and by seeing the importance of connectivity, started an email chain when we were cast and said, “OK, guys, here you all are. We are going to have dinner soon but have at it.” So from the very beginning, we expressed ourselves, and it took us to a very deep place very quickly. We have a WhatsApp chain that we’ve started now. We are very close. We are always checking back in with each other. 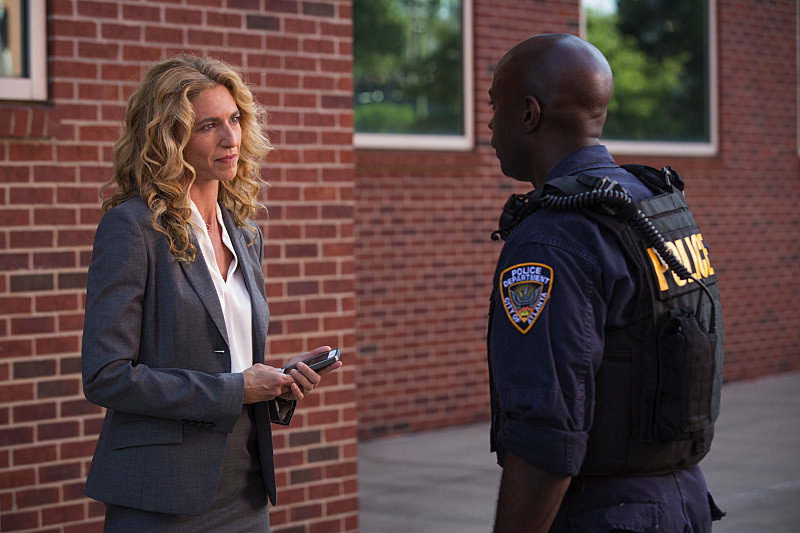 Pictured (L-R): Claudia Black as Dr. Sabine Lommers and David Gyasi as Lex in Containment — “Be Angry at the Sun.” – Photo Credit: Bob Mahoney/The CW. © 2015 The CW Network, LLC. All rights reserved. GALO: I think that’s remarkable that you and your follow cast and crew members formed such a bond on the set of both shows. Some of those friendships could end up lasting your entire life. Jumping ship for a little bit, your role as Dahlia on The Originals was fantastic. Given that the show is known for bringing back dead characters, would you say there’s a chance for her to return at some point? CB: I hope so — I keep telling them as often as I can to bring her back! I even have a justification for how we can bring her back as a blonde, ha! I merged with Esther [her sister, played by Alice Evans], so anything is possible. I have had [this] grief since I was about 20 when I left my first gig, and that sadness of saying goodbye to everyone because you’ll never have that combination again. In this business, people are always coming and going. The business takes you all over the place. I am just grateful to be working on something where I look forward to reuniting with them. If anything on the inside for me has changed, it is a newfound humility for what we are getting to do and the people we are getting to do it with. GALO: You also seem to really enjoy doing work in the sci-fi genre. I was wondering if while growing up it was something you were attracted to as a viewer as well. CB: Australian broadcasters were nervous about airing science fiction on TV, and even when I was cast on those shows, the makers were honest that they didn’t know what to do with it because there was no blueprint. I didn’t grow up with a lot of it on my TV screen, but I loved sci-fi films. GALO: Did you have any favorites? CB: Ooo, yes! Blade Runner (1982) was extremely important to me. I think what Ridley Scott did with it in terms of art direction and guessing what culture would be like — what our world would look like — was great. I was into the dark storytelling and figuring out what it was I wanted to do. I was a musician in my childhood and transitioned more into acting. I remember seeing Sigourney Weaver in Alien (1979) and Linda Hamilton in Terminator (1984) and saying, “I can do that!” It was those strong women emerging in the late ’80s and early ’90s who paved the way for me to able to play complex, interesting women. We have come a long way in the media since I was a child and it’s an interesting wave to ride, getting people comfortable with casting women in prominent roles, like when Lucy Lawless was cast in Xena (1995-2001). It was a big deal for the rest of us that a woman had been given that responsibility. There have been a lot of comedians who have joked that 10 years ago if you were watching a film where the President was African-American, then you knew it was set in the future. We have broken that limitation. The same joke could be made about female presidents, except it’s a possibility this year. When I was growing up, science fiction was one of the rare genres where women were now helming stories. We were learning about humanity from an outside perspective, so I love playing aliens. I was so not in my body as a kid — I was so uncoordinated — so to try to find a way to be grounded, it was a fantastic challenge for me. GALO: You also have a prolific career as a video game voice actress. How does that experience benefit you as an actor when you are in front of the camera? CB: The thing about this is that the people making it understand the importance of chemistry, which means you are performing it like a play but it requires you to have all the disciplines that are needed — a good voice, a body that moves with a certain signature, and a sense of theatrics in terms of being able to use your imagination. I am working live with people, and [so by] being able to connect with them, for me, it is the best of theater and voice acting. We need to be team players to make those choices [and to take] risks to make games. The industry stopped and took notice because the results are different. How has it informed my on-camera work? I would say that the people I have worked with here are so playful. We got very silly and giggly the other day on a gig that I can’t talk about still, but we were like just a bunch of really goofy kids [who are] out to play. We have had days on the set where I feel like I am four years old again. We are playing these things, which earlier we would have done using just our imaginations, but now we are on an expensive set, these bunch of grown-ups, saying these lines that takes us right back to the sandbox. GALO: Do you have any other upcoming projects? CB: None that I can talk about, unfortunately. I am just excited to share them as soon as I can. Containment is one on the most immediate horizon — and I am curious to see how it affects people! “Containment” premiered on April 19. Watch the all-new episode on Tuesday, May 3 at 9/8 c on the CW or catch-up on old ones on the CW’s official website. Can’t get enough of Claudia Black? Follow her on Twitter @TheClaudiaBlack to stay up to date on her latest endeavors. Video courtesy of The CW Television Network.